As last weekend was the centenary of the death of Edward VII, it seems an appropriate occasion to highlight this image (46801i) from our collections. It was drawn by Sir Luke Fildes (1844-1927), shows the King on his deathbed, and was published by The Graphic with the permission of Queen Alexandra. By 1910 Fildes was a successful society portraitist – he had painted the coronation portraits of Edward and Alexandra – but he had come to prominence in the late 1860s as an illustrator with a social conscience depicting (often in The Graphic) the social problems of late Victorian Britain. 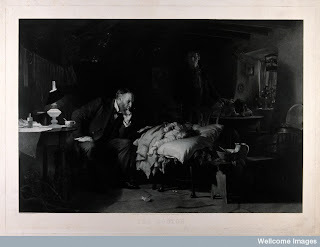 Fildes is perhaps best known today for another scene of a bedside, The Doctor. In what has become one of the most recognisable images in the history of medicine, a family doctor sits patiently, attending an ill child in a poor, rural household, with the parents in close – but powerless – attendance. There’s still a debate over the origins of The Doctor: one argument is that it was inspired by a bedside vigil spent whilst Fildes’s own son was dying from tuberculosis in 1877 (Fildes being so impressed by the professionalism of the doctor treating his son, that he painted this work, in part, in his honour). 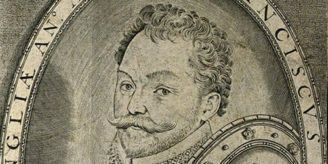 Or indeed, the painting may derive from a royal connection, with Edward VII’s mother Queen Victoria, ordering it to commemorate the service of her own physician, Sir James Clark, when she sent him to care for the sick child of a servant on her Balmoral estate. Either way, we do know that the painting was commissioned by Sir Henry Tate and completed in 1891 for the opening exhibition of the Tate Gallery. Still a part of the Tate’s collections, The Doctor was an immensely popular painting in its day, with many engravings and prints made of it. Shown above is such a print in our collections, produced in 1893 (42577i). The Doctor is a much discussed work. It has been seen as a comment on the professionalism and dedication of Victorian medical professionals but also an idealisation of doctors in a time where industrialisation meant such personal care for individual patients was declining. 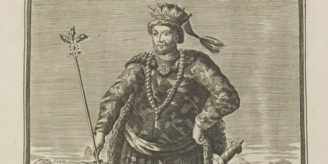 Another reading suggests it marks a stage before the age of antibiotics, where attendance and patience prove ineffectual against infectious disease. In a recent article for the British Journal of General Practice, Jane Moore even discussed the relevance of the painting to medical practice in the 21st century. In The Doctor, the light reflecting through the cottage window perhaps suggests the worst of the child’s illness is over and that they will recover. 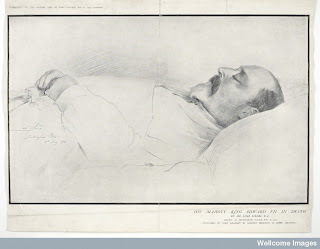 In Fildes’s other bedside scene, the dying Edward VII is shown alone: his family – and doctor – absent.